GMB activists from Sandwell branch will be joining many more from Birmingham & West Midlands region and further afield today (Saturday 10th February) in support of one of our activists who has been sacked from his job for trying to organise members. 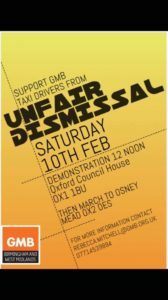 Legal action has been launched against an Oxfordshire based private hire and taxi company, on behalf of a long-standing driver who claims that he was dismissed as a result of being an activist for the trade union, GMB. The claims, which were launched in the Employment Tribunal by the GMB union last month, represented by Leigh Day, allege that Mohamed Fadlalla is an employee, rather than a self-employed contractor, and that his contract was terminated because of trade union activity. Mr Fadlalla also claims that he has not received national minimum wage and holiday pay. Mr Fadlalla has claimed interim relief, which if successful, would require 001 Taxis to give him his job back or pay him as if his contract had not been terminated until the final outcome of his unfair dismissal case. The question of whether he is an employee and the interim relief application will be decided by the Tribunal in a 3 day hearing beginning on 28 February 2018. “We believe that Mohamed is entitled to the same employment protections as every other employee in the UK and one of the most important of those is to be allowed to join a trade union and encourage others to join without being dismissed or victimised by his employer”. “I have worked for my employer in many different roles since 1998. Since January 2016 I have carried out the same school run for them, transporting a group of children with special needs to school each day. I loved my job and had worked hard to build a good relationship with the children and their parents. I am shocked that I have been treated in this way and it has left me without any income to support my family”.